Hit the links under snowy peaks and blue Colorado skies at one of several Winter Park golf courses. A classic mountain course for all levels of golfers. Course consistently ranks as one of the top mountain golf courses in Colorado, open to public. Enjoy the gorgeous course with breathtaking views of the Rocky Mountains. Only 20 minutes between Winter Park and Rocky Mountain Natl Park. Located 12 miles north of Winter Park, Pole Creek offers tree-lined, links-style holes with breathtaking mountain views. 27-holes at 8,600 feet above sea level. There are four public Winter Park CO golf courses from which to choose. 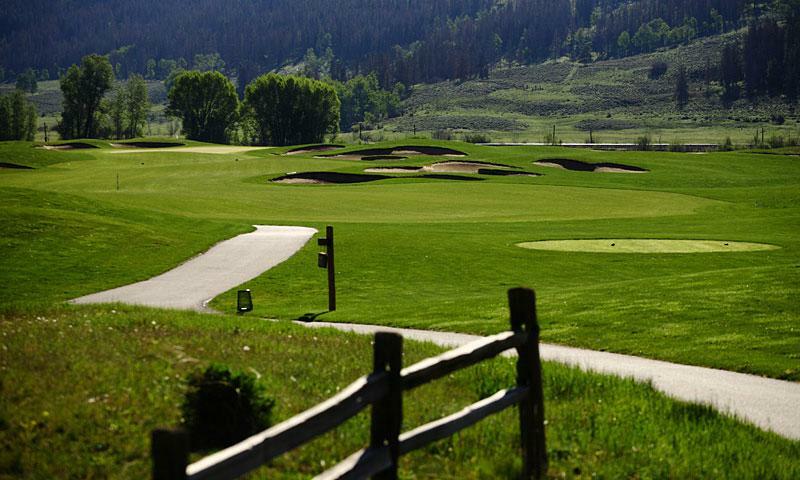 Cost is between $34 and $99 for an 18-hole round of Winter Park Colorado golf. Private instruction and driving ranges are available at all area courses. All courses are a short drive from Winter Park. Hit 'em straight and long at one of these fine Winter Park golf establishments. Location – Pole Creek is located 11 miles outside Winter Park in Tabernash on County Road 51. Course Description – Pole Creek consists of three courses for a total of 27 holes surrounded by pine forest, five lakes and meadows. Location – Grand Lake is located outside Granby on County Road 48. Course Description – 18 holes of narrow fairways above 8,000 feet. Location – Golf Granby Ranch is located 20 miles outside Winter Park on Village Road. Course Description – 18 championship holes await golfers at this Granby Ranch course. Location – The Grand Elk is one mile south of Granby on the west side of Highway 40. Course Description – Described as “shaped by the landscape,” The Grand Elk is just under 7,000 yards. Golf Courses Guide provides a non biased review and connection to golf courses, instruction, and gear around the world. Offering information on tournaments, lessons, and courses throughout Colorado.